Lithium Aluminum Hydride LiAlH4 is the stronger ‘common’ carbonyl reducing agent. In addition to reducing aldehydes and ketones like NaBH4, LiAlH4 will also reduce carboxylic acids and carboxyl derivatives. 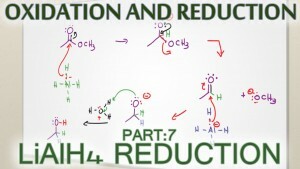 The video below shows you a molecule and reaction overview followed by the reduction mechanisms for LiAlH4 with various carbonyl compounds.